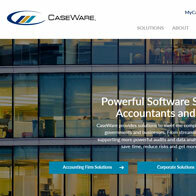 CaseWare provides solutions to meet the complex needs of accounting firms, governments and businesses. From streamlining financial reporting to supporting more powerful audits and data analytics – CaseWare’s solutions help save time, reduce risks and get more out of data. CaseWare engaged Vellum Marketing to provide creative writing support for the development of a new website. Responsibilities included development of key themes, positioning and creative writing.